Vitamin D is crucial to our well-being. In this article, we discuss the history of its discovery, how we get it, and the evidence for its clinical effectiveness. There are currently over 400 clinical research studies in progress focusing on vitamin D. These studies are all listed on the National Cancer Institute’s website (www.ClinicalTrials.gov) and they range from studies seeking to understand how vitamin D works in the body, to those for the treatment of numerous different diseases. WHAT IS VITAMIN D? WHAT ARE ITS VARIOUS FORMS? Vitamin D goes through three different stages in its formation and metabolism: First from cholecalciferol to calcidiol and then to its active form, calcitriol. The cycle of vitamin D’s activity begins as cholecalciferol (vitamin D3), the naturally occurring form of vitamin D, which is made in large quantities in your bare skin when sunlight strikes it. It can be taken as a supplement and is also found in small amounts in some foods. Cholecalciferol is first transformed by the body into calcidiol (25-OH-D3, or 25D3), a pre-hormone. The discovery of vitamin D resulted from the confluence of two different streams of research thinking that had been in progress for several decades: a search for understanding of the chemical nature of cholesterol, and the search for a cure for the crippling bone disease called rickets. Adolf Windaus (1876–1959) was a German chemist who devoted his entire career to the study of the molecular structure of cholesterol, for which he was awarded the Nobel Prize in 1928. Windaus was unusual among scientists in Germany in that he openly opposed the Nazi party and, in 1933, protected a Jewish graduate student from dismissal from his university. HOW DOES THE BODY MAKE VITAMIN D FROM SUNLIGHT? Only 20 to 30 minutes of full-body noontime summer sun exposure stimulates the skin to produce as much as 10,000 IU vitamin D, which is 50 times higher than the US government’s recommended 200 IU per day. (Vitamin D Council 2009) Or, one can obtain that same amount by drinking 100 glasses of milk. WHAT ABOUT THE HAZARDS OF SUN EXPOSURE? With melanoma, however, the evidence is not so clear-cut, with most cases occurring on body areas with less sun exposure (according to two different meta-analyses of 24 studies including nearly 20,000 people. )(Siskind, Whiteman et al. 2005; Caini, Gandini et al. 2009) Although there is clear evidence that a history of intermittent sun exposure and sunburn significantly increase the risk of melanoma, conversely a high occupational history of sun exposure seems to reduce that risk. (Gandini, Sera et al. 2005) It appears that people who live further from the equator, and whose sun exposure is more intermittent than continuous, will be more likely to develop melanoma. However, more research needs to be done to evaluate the risk-benefit ratio of possibly increased risk of melanoma, versus the overall health benefits of extra vitamin D3 achieved by increasing sun exposure. WHAT HAPPENS IN THE MAKING OF VITAMIN D, AFTER SUNLIGHT STARTS THE PROCESS? Why Is There Controversy About Recommended Levels of Vitain D? In the United States, adult dietary requirements of 200 IU/day are established as just enough to prevent osteomalacia (softening of the bones due to a lack of vitamin D) in the absence of sunlight. WHY ARE THE LOW LEVELS OF RECOMMENDED INTAKE A PROBLEM? The problem is several-fold: (1) vitamin D plays such an important role in human physiology and immune function, as described previously; (2) it helps the body in healing a wide range of illnesses; (3) we spend far less time outdoors than our ancestors; (4) many studies have shown low vitamin D blood levels, even in countries such as Pakistan which have plenty of sunlight;(khan and Iqbal 2009) and (5) there is little vitamin D present in most foods, meaning that without additional supplementation, many people have very low vitamin D blood levels. THE POLITICS OF VITAMIN D: HOW DID THIS HAPPEN? HOW IS DOSAGE OF VITAMIN D MEASURED? Dosage of vitamin D is generally measured in International Units (IU), a system of units based on the biological effect of the substance in question. For vitamin D, 400 IU equals 10 micrograms (μg). Because IUs are specific to the substances they measure, one IU of vitamin D, for example, does not equal one IU of vitamin A. WHAT ARE SOME OF THE BENEFITS OF VITAMIN D SUPPLEMENTATION? HOW IS VITAMIN D MEASURED? WHAT ARE OPTIMAL BLOOD LEVELS OF VITAMIN D? WHO IS AT RISK FOR LOWER VITAMIN D LEVELS? WHAT ARE OPTIMAL LEVELS OF DIETARY INTAKE OF VITAMIN D? There are differences between individual people in the body’s ability to achieve higher serum vitamin D levels in response to taking it in supplement form. These differences appear to arise from a genetic trait called the vitamin D binding protein, of which there are three known genotypes. A dose evaluation study of 98 adults sought to identify what effect this protein would have on the body’s ability to absorb two different doses of vitamin D: 600 or 4000 IU over a one-year period. The most common genotype (TT genotype, found in 48 of 98 people) achieved a 97% increase (nearly double the baseline). Slightly less common (31 of 98 people) is the Tk genotype, where a 151% increase was observed (two and a half times baseline levels). The most rare genotype (kk genotype, found in 3 of 98 people) achieved a 307% increase in vitamin D levels from supplementation (reaching over four times their baseline levels). (Fu, Yun et al. 2009) This suggests that response to vitamin D supplements differs between individuals and, therefore, testing blood levels before and during supplementation is reccomended. In a study of smokers from Finland, higher blood levels of vitamin D (without supplementation) were associated with a three-fold increase in risk of pancreatic cancer. However, it is important to note that this study took place in the same group in which an earlier study found that beta-carotene caused an increase in the rate of developing lung cancers. (Stolzenberg-Solomon, Vieth et al. 2006) This suggests that in smokers, vitamin D supplementation may have a paradoxical effect, much like that seen with beta-carotene. WHAT KINDS OF VITAMIN D SUPPLEMENTS ARE RECOMMENDED? HOW CAN YOU DETERMINE WHAT YOUR VITAMIN D INTAKE IS? HOW CAN YOU DETERMINE YOUR SERUM VITAMIN D LEVELS? Blood levels of 25-hydroxy-vitamin D (25-OH-D), the active form of Vitamin D, can be tested by most medical laboratories, with the order of a blood test from a medical provider. Vitamin D plays an essential role in maintaining important body functions such as the immune system and bone health. While vitamin D supplementation is helpful in preventing and treating many health conditions, it is certainly not a substitute for going outdoors. We hope that this comprehensive examination of the evidence for vitamin D safety and efficacy will stimulate many engaging and productive dialogues between physician and patient about safe levels of vitamin D supplementation and the advisability of vitamin D blood level monitoring and therapy. Amir, E., C. E. Simmons, et al. (2009). “A phase 2 trial exploring the effects of high-dose (10,000 IU/day) vitamin D(3) in breast cancer patients with bone metastases.” Cancer. Bar-Or, D. and G. Yoel (1981). “Calcium and calciferol antagonize effect of verapamil in atrial fibrillation.” Br Med J 282: 1585-1586. Blackmore, K. M., M. Lesosky, et al. (2008). “Vitamin D from dietary intake and sunlight exposure and the risk of hormone-receptor-defined breast cancer.” Am J Epidemiol 168(8): 915-924. Cannell, J. J., R. Vieth, et al. (2008). “Cod liver oil, vitamin A toxicity, frequent respiratory infections, and the vitamin D deficiency epidemic.” Ann Otol Rhinol Laryngol 117(11): 864-870. Cranney, A., T. Horsley, et al. (2007). “Effectiveness and safety of vitamin D in relation to bone health.” Evid Rep Technol Assess (Full Rep)(158): 1-235. Dent, C. E. and R. Smith (1969). “Nutritional osteomalacia.” Q J Med 38(150): 195-209. Ding, C., F. Cicuttini, et al. (2009). “Serum levels of vitamin D, sunlight exposure, and knee cartilage loss in older adults: the Tasmanian older adult cohort study.” Arthritis Rheum 60(5): 1381-1389. Fu, L., F. Yun, et al. (2009). “Common genetic variants of the vitamin D binding protein (DBP) predict differences in response of serum 25-hydroxyvitamin D [25(OH )D] to vitamin D supplementation.” Clin Biochem 42(10-11): 1174-1177. Gozdzik, A., J. L. Barta, et al. (2008). “Low wintertime vitamin D levels in a sample of healthy young adults of diverse ancestry living in the Toronto area: associations with vitamin D intake and skin pigmentation.” BMC Public Health 8: 336. Gupta, D., C. A. Lammersfeld, et al. (2009). “Vitamin D and prostate cancer risk: a review of the epidemiological literature.” Prostate Cancer Prostatic Dis 12(3): 215-226. Hathcock, J. N., A. Shao, et al. (2007). “Risk assessment for vitamin D.” Am J Clin Nutr 85(1): 6-18. Hayes, C. E. and E. Donald Acheson (2008). “A unifying multiple sclerosis etiology linking virus infection, sunlight, and vitamin D, through viral interleukin-10.” Med Hypotheses 71(1): 85-90. Holick, M. F. (2004). “Sunlight and vitamin D for bone health and prevention of autoimmune diseases, cancers, and cardiovascular disease.” Am J Clin Nutr 80(6 Suppl): 1678S-1688S. Holick, M. F. (2008). “Vitamin D and sunlight: strategies for cancer prevention and other health benefits.” Clin J Am Soc Nephrol 3(5): 1548-1554. Ish-Shalom, S., E. Segal, et al. (2008). “Comparison of daily, weekly, and monthly vitamin D3 in ethanol dosing protocols for two months in elderly hip fracture patients.” J Clin Endocrinol Metab 93(9): 3430-3435. Khan, A. H. and R. Iqbal (2009). “Vitamin D deficiency in an ample sunlight country.” J Coll Physicians Surg Pak 19(5): 267-268. Kimball, S., H. Fuleihan Gel, et al. (2008). “Vitamin D: a growing perspective.” Crit Rev Clin Lab Sci 45(4): 339-414. Kimball, S. M., M. R. Ursell, et al. (2007). “Safety of vitamin D3 in adults with multiple sclerosis.” Am J Clin Nutr 86(3): 645-651. Knight, J. A., M. Lesosky, et al. (2007). “Vitamin D and reduced risk of breast cancer: a population-based case-control study.” Cancer Epidemiol Biomarkers Prev 16(3): 422-429. Knight, J. A., J. Wong, et al. (2009). “Vitamin D association with estradiol and progesterone in young women.” Cancer Causes Control. Maalouf, J., M. Nabulsi, et al. (2008). “Short- and long-term safety of weekly high-dose vitamin D3 supplementation in school children.” J Clin Endocrinol Metab 93(7): 2693-2701. Macdonald, H. M., A. Mavroeidi, et al. (2008). “Vitamin D status in postmenopausal women living at higher latitudes in the UK in relation to bone health, overweight, sunlight exposure and dietary vitamin D.” Bone 42(5): 996-1003. McKevoy GK, e. (1998). AHFS Drug Information. Bethesda, MD, American Society of Health-System Pharmacists. Mocanu, V., P. A. Stitt, et al. (2009). “Long-term effects of giving nursing home residents bread fortified with 125 microg (5000 IU) vitamin D(3) per daily serving.” Am J Clin Nutr 89(4): 1132-1137. National Academy of Sciences (1989). Recommended dietary allowances. 10th ed. Washington, DC, National Academy Press. Norman, A. W. (1998). 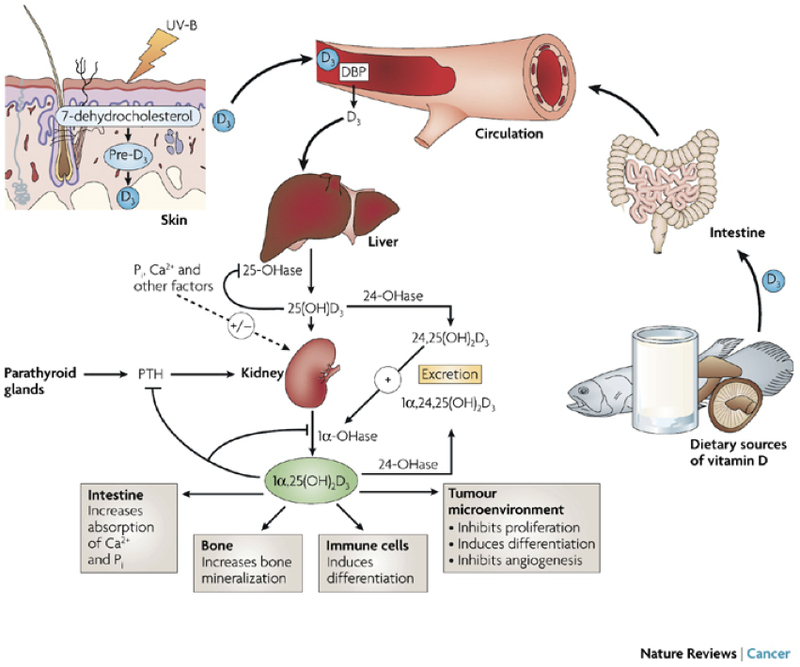 “Sunlight, season, skin pigmentation, vitamin D, and 25-hydroxyvitamin D: integral components of the vitamin D endocrine system.” Am J Clin Nutr 67(6): 1108-1110. Parfitt, A. M. (1972). “Thiazide-induced hypercalcemia in vitamin D-treated hypoparathyroidism.” Ann Intern Med 77: 557-563. Perez-Lopez, F. R. (2008). “Sunlight, the vitamin D endocrine system, and their relationships with gynaecologic cancer.” Maturitas 59(2): 101-113. Pierrot-Deseilligny, C. (2009). “Clinical implications of a possible role of vitamin D in multiple sclerosis.” J Neurol 256(9): 1468-1479. Reichrath, J. (2007). “Sunlight, skin cancer and vitamin D: What are the conclusions of recent findings that protection against solar ultraviolet (UV) radiation causes 25-hydroxyvitamin D deficiency in solid organ-transplant recipients, xeroderma pigmentosum, and other risk groups?” J Steroid Biochem Mol Biol 103(3-5): 664-667. Rosso, S., F. Sera, et al. (2008). “Sun exposure prior to diagnosis is associated with improved survival in melanoma patients: results from a long-term follow-up study of Italian patients.” Eur J Cancer 44(9): 1275-1281. Schleithoff, S. S., A. Zittermann, et al. (2006). “Vitamin D supplementation improves cytokine profiles in patients with congestive heart failure: a double-blind, randomized, placebo-controlled trial.” Am J Clin Nutr 83(4): 754-759. Schwartz, J. B. (2009). “Effects of vitamin D supplementation in atorvastatin-treated patients: a new drug interaction with an unexpected consequence.” Clin Pharmacol Ther 85(2): 198-203. Seiden-Long, I. and R. Vieth (2007). “Evaluation of a 1,25-dihydroxyvitamin D enzyme immunoassay.” Clin Chem 53(6): 1104-1108. Sigmundsdottir, H., J. Pan, et al. (2007). “DCs metabolize sunlight-induced vitamin D3 to ‘program’ T cell attraction to the epidermal chemokine CCL 27.” Nat Immunol 8(3): 285-293. Stolzenberg-Solomon, R. Z., R. Vieth, et al. (2006). “A prospective nested case-control study of vitamin D status and pancreatic cancer risk in male smokers.” Cancer Res 66(20): 10213-10219. Taskapan, H., R. Vieth, et al. (2008). “Unusually prolonged vitamin D intoxication after discontinuation of vitamin D: possible role of primary hyperparathyroidism.” Int Urol Nephrol 40(3): 801-805.
van den Berg, H. (1997). “Bioavailability of vitamin D.” Eur J Clin Nutr 51 Suppl 1: S76-79. Vieth, R. (1999). “Vitamin D supplementation, 25-hydroxyvitamin D concentrations, and safety.” Am J Clin Nutr 69(5): 842-856. Vieth, R. (2006). “Critique of the considerations for establishing the tolerable upper intake level for vitamin D: critical need for revision upwards.” J Nutr 136(4): 1117-1122. Vieth, R. (2007). “Vitamin D toxicity, policy, and science.” J Bone Miner Res 22 Suppl 2: V64-68. Vieth, R. (2009). “How to optimize vitamin D supplementation to prevent cancer, based on cellular adaptation and hydroxylase enzymology.” Anticancer Res 29(9): 3675-3684. Vieth, R. (2009). “Vitamin D and cancer mini-symposium: the risk of additional vitamin D.” Ann Epidemiol 19(7): 441-445. Vieth, R., H. Bischoff-Ferrari, et al. (2007). “The urgent need to recommend an intake of vitamin D that is effective.” Am J Clin Nutr 85(3): 649-650. Vieth, R., R. Choo, et al. (2006). “Rise in prostate-specific antigen in men with untreated low-grade prostate cancer is slower during spring-summer.” Am J Ther 13(5): 394-399. Vieth, R. and S. Kimball (2006). “Vitamin D in congestive heart failure.” Am J Clin Nutr 83(4): 731-732. Wagner, D., H. E. Hanwell, et al. (2009). “An evaluation of automated methods for measurement of serum 25-hydroxyvitamin D.” Clin Biochem 42(15): 1549-1556. Witte, K. K. and A. L. Clark (2005). “Chronic heart failure and multiple micronutrient supplementation: realistic hope or idealistic conjecture?” Heart Fail Monit 4(4): 123-129. Wolf, G. (2004). “The discovery of vitamin D: the contribution of Adolf Windaus.” J Nutr 134(6): 1299-1302. Wu, H., A. Gozdzik, et al. (2009). “The development and evaluation of a food frequency questionnaire used in assessing vitamin D intake in a sample of healthy young Canadian adults of diverse ancestry.” Nutr Res 29(4): 255-261. This entry was posted on Wednesday, April 28th, 2010 at 12:39 pm. It is filed under Avenues, Headline and tagged with Research, Vitamin D.